Today I wanted to talk about the importance of taking care of yourself. Over the last several months I have realized the importance of listening to your body and what it needs. When life gets busy I tend to focus more on what needs to be accomplished or what others need and all of my needs immediately fall to the wayside. I don't think it is a bad thing to want to take care of others, you just can't forget to take care of yourself in the process. As I mentioned in my New Years post I am currently unemployed. I quit my job last October and it has given me the opportunity to slow down and listen to my body. It was a much needed break to focus on my mental health. At the beginning of the month my depression hit me hard. I listened to my body and took it slow. Usually I can get several things off of my to do list in a day but instead I took the entire day to clean two rooms. And by clean I mean pick up. At the end of the day it may not feel like you did much but you took care of yourself and that is what is important. A few years ago I worked in a management position in the customer service field. I spent all day running back and forth between seven employees, hundreds of customers and their needs. It was exhausting and very time consuming. Most days it would be three o clock in the afternoon and I would realize I had not had anything to eat or drink that day. I never took the time to take care of myself. I ran myself ragged and ended up getting sick. The doctor's couldn't figure out what was wrong with me. They put me on bedrest and I took a week off of work and eventually got better. The doctors never found out what was wrong with me but I honestly feel like my body was telling me to take a break. 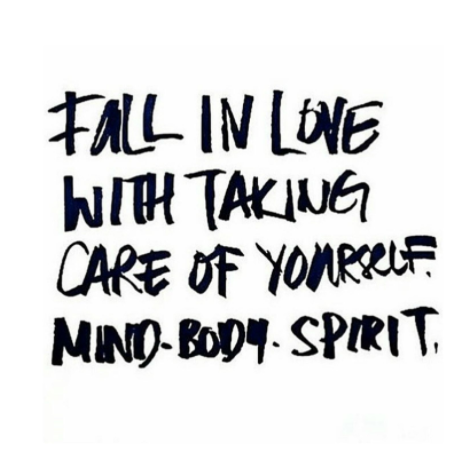 Please take the time to take care of yourself. As they say you can't pour from an empty cup. Stay in bed and watch trashy TV. Take a whole day to clean two rooms. Whatever your body is telling you you need to do, DO IT! But be honest with yourself as well. That day in bed can easily turn into a week and chances are you don't really need that.